A dog’s undercoat is exactly as it sounds, it’s a second coat beneath the outer coat that keeps your dog warm in winter and cool in summer. Breeds that are native to colder areas generally tend to have undercoats and these include the German Shepherd, Pomeranian, Chow, Husky, Malamute and Samoyed. Double coated breeds have long and course outer coats that protects the undercoat that is usually fluffy and soft. 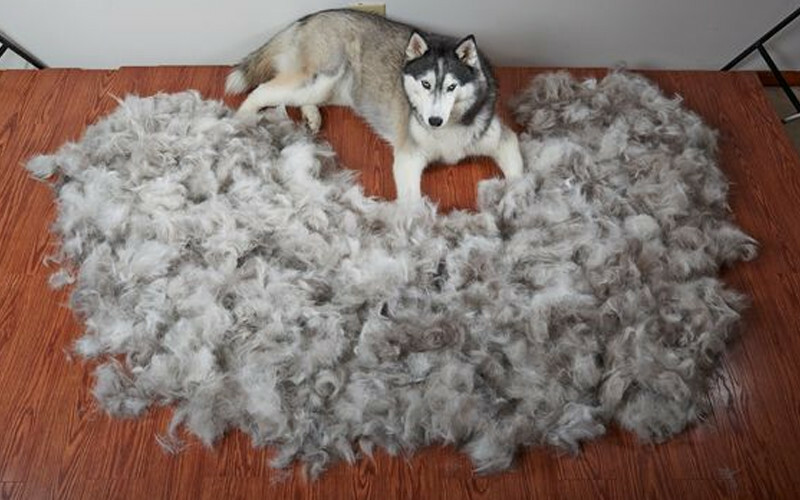 While dogs shed their outer coat all year round, the undercoat is usually shed seasonally. Breeds with an undercoat require a lot of maintenance all year round, but need a full deshed and blow out at each change of the season. You need to brush the undercoat all year round to prevent any matting and during shedding time to remove all of the loose fur. This can be done with a rake or a deshedding tool. The purpose of the undercoat is to keep them cooler in summer and warm in winter. The top coat with the tougher guard hairs protect your dog from the sun’s rays and insect bites. In summer, your dog will shed the soft undercoat, just leaving behind the guard hairs. Without the undercoat, the air cannot circulate beneath the outer hair and cannot keep the skin cool. Single coated breeds have hair that just keeps growing, double coated breeds only grow their fur to a certain length. If you shave a single coated breed, the coat will grow back without any change. Shaving a double-coated breed can really ruin the coat. The texture of the soft undercoat will absorb the sun’s rays, making your dog hotter in summer. The best way to keep your dog cool in summer is to ensure that your dog is groomed regularly and has a de-shed at the beginning of each season to remove all of the dead hair and to ensure that the outer coat can work as it is intended, as an insulator. Brushing alone does not get all the undercoat. Brushing in conjunction with regular bathing promotes shedding and then drying with a high velocity drier to push out a lot of the undercoat. The best thing to reduce/prevent shedding is to have regular grooming every 4 weeks. Speak to your local Jim’s Dog Wash franchisee, who can put your dog on a regular cycle for grooming to keep your dog’s coat in top condition. Call Jim’s Dog Wash on 131546 to speak to one of fully trained operators who can advise you on a schedule that suits you and your dog.